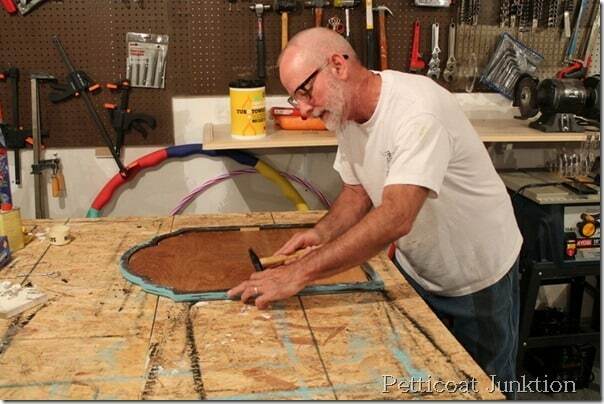 Let’s make a chalkboard today. 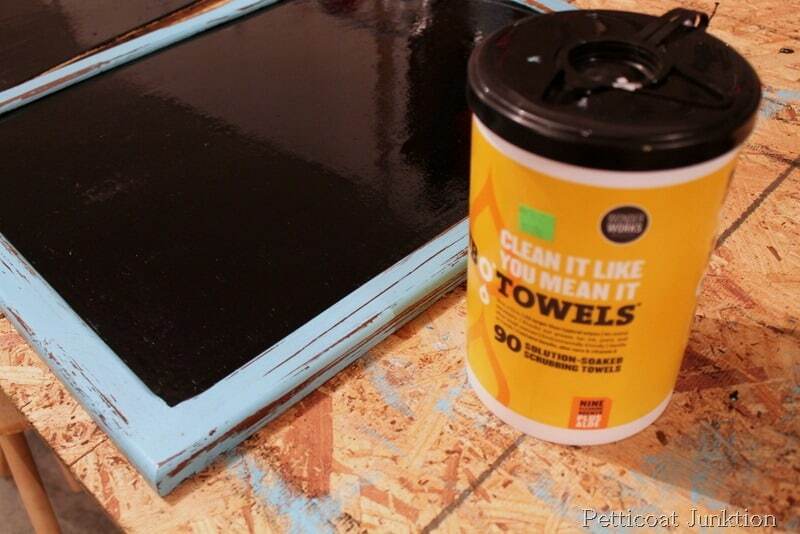 You can make a chalkboard out of just about anything. 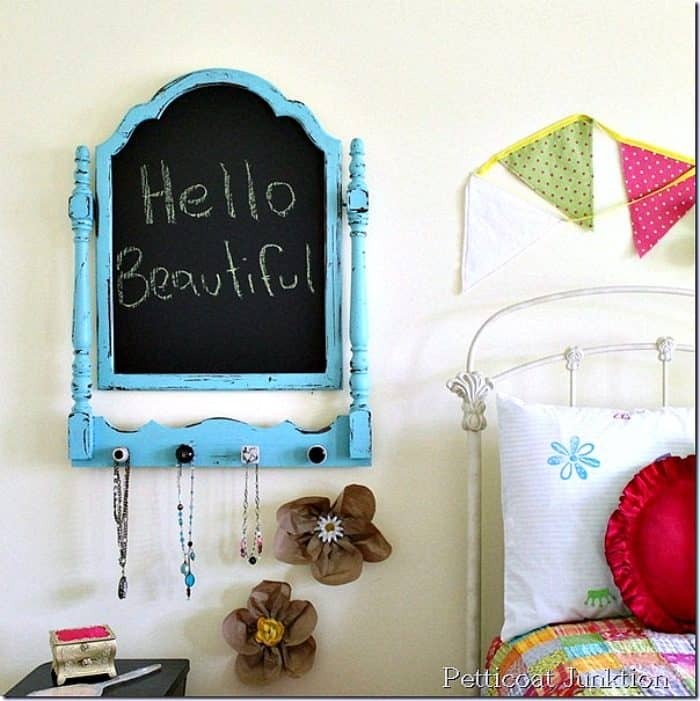 This chalkboard project is made from the mirror holder/frame of a vintage dresser. The mirror was missing and all we had to do was cut a wood panel to replace the missing mirror. Then paint it with chalkboard paint. You can’t go wrong with Turquoise. I mean, turquoise goes with just about everything. I painted the wood frame before adding the chalkboard panel. This vintage mirror dresser topper came from My Favorite Junk Shop. It had the cardboard backing but the mirror was gone. You see that a lot with these old pieces. The JTS (aka hubby, aka The Junktion Technical Specialist) cut a piece of board to replace the mirror and he also cut the two long ends off the mirror stand. They were a little much for the frame turned chalkboard. I mixed the turquoise paint myself from paints I had on hand. I love combining paint colors I have on hand to make a brand new never before seen color! Now for my duh moment. This is the project I was preparing for Salvage Saturday but it wasn’t ready in time to take pictures and do the post. Here’s why….. I painted a thick coat of chalkboard paint on the wood Friday morning and waited for it to dry, but it stayed tacky for hours and hours! The next day it was dry but it was really shiny, hum. We decided to have a fun day Saturday so the JTS and I drove up into Kentucky. You know, sometimes in the back of your mind….maybe in your subconscious….a little bell goes off…..ding,ding,ding. 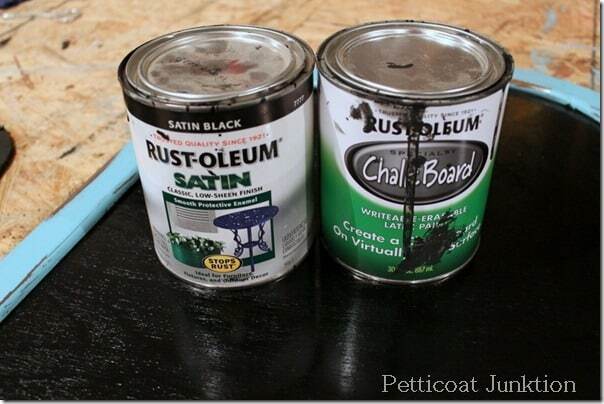 I wonder if I used oil based black paint instead of chalkboard paint? When we returned from our day trip I went out to the workshop and sure enough I had used black oil based paint instead of the chalkboard paint, duh! That’s what happens when you just grab and go. See the picture above, the cans do look similar. I haven’t used that can of oil based paint in years but I guess when I re-organized the workshop it got shifted to the front. 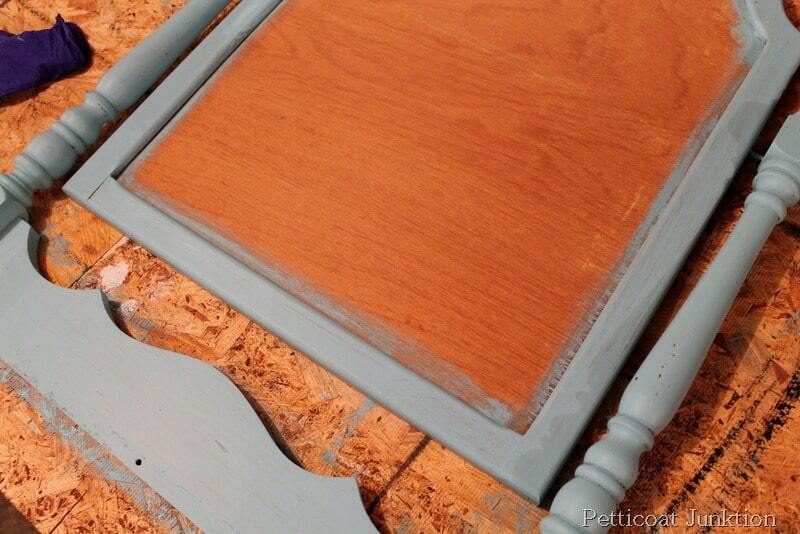 I repainted with the chalkboard paint and then I distressed the turquoise frame using the wet distress method. I used wet shop towels like you buy in the canister at home improvement stores and rubbed the paint off. You have to do this just after the paint dries. Don’t wait too long. This is what happens in the workshop when I break into a sweat from hard work. 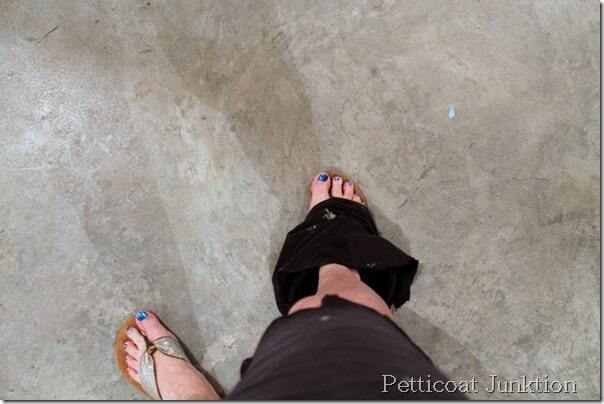 I take a pair of scissors and attack my work pants. That’s one way to cool off. The JTS just looked at me like I was crazy. The turquoise chalkboard is hanging in the granddaughters bedroom at our house. 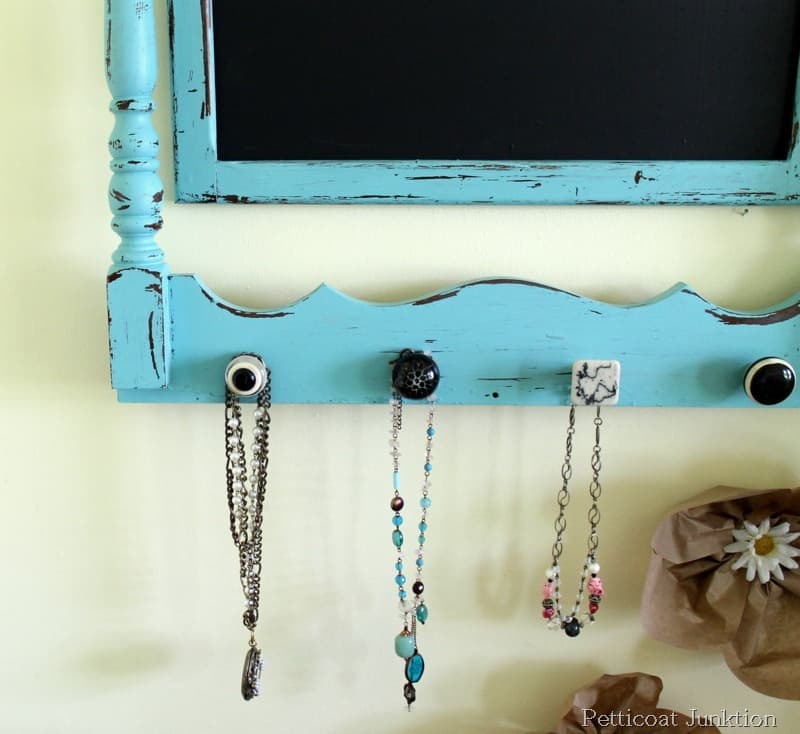 Looks great with those cute little necklaces hanging from the knobs. The little knobs I used for hangers came from Hobby Lobby. I drilled holes in the frame for the knobs. Easy. 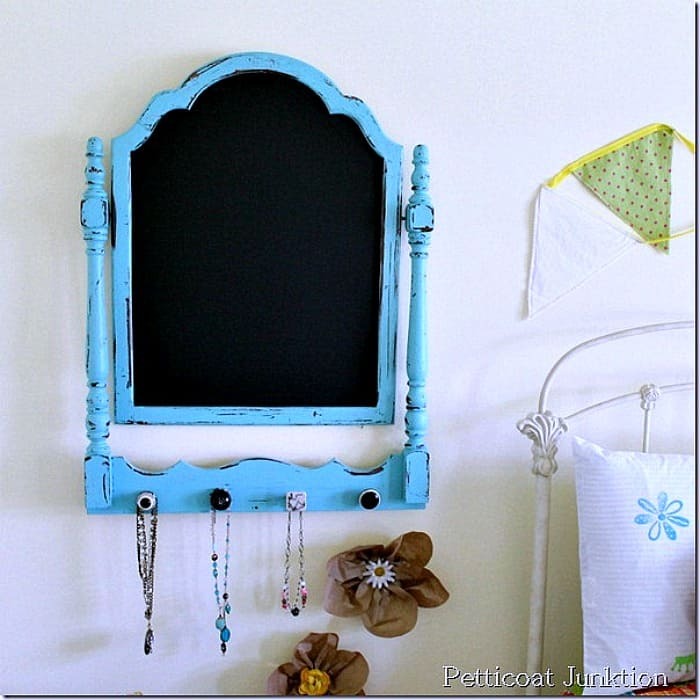 Check out this chalkboard made from another vintage dresser mirror frame. It’s white and sooooo pretty. Click here….White Framed Chalkboard Has A Few Hangups. This craft project is really simple, and quick, if you don’t mess up and use the wrong paint. Have you had a similar “duh” moment? Please tell me it’s not just me! Kathy, that is SO cute! And so is the white one you did; I went back and looked at it. I would love to do one, but I don’t know how I would get the backing cut to replace the mirror. I don’t have any kind of power tools, especially saws. Could you take it to Lowes or Home Depot and have them cut something like that? I guess I could inquire. Cutting your pants off because you’re too hot takes the cake! Oh, well, you just created another pair of shorts for yourself! I’m pretty sure Home Depot and Lowes will cut a board for you if you have the measurements. I forgot to mention that we use Luan (type of board) for these projects. I’m always doing nutty things like cutting my pants to make shorts. I just don’t tell you guys about all of them or you would really think I’m crazy. Adorable! Lucky granddaughters … always finding something new in their room! I really like the mirror. 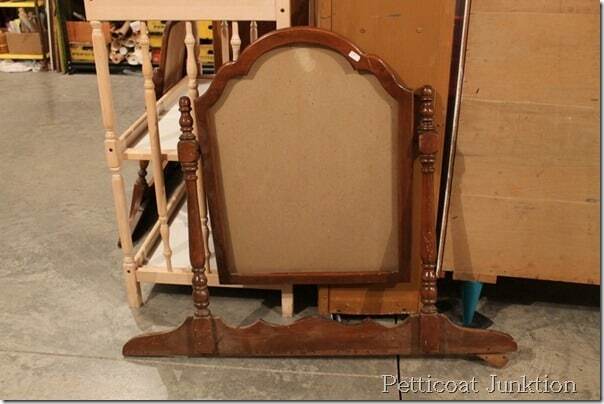 I saw a headboard that was free the other day and thought about how I could have used this piece. It was gone in a few hours. Yesterday I had a day where I went out without my pocketbook so I couldn’t pay the eye dr. 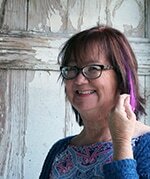 I had two appts. yesterday and since it was out of the ordinary it threw me off. 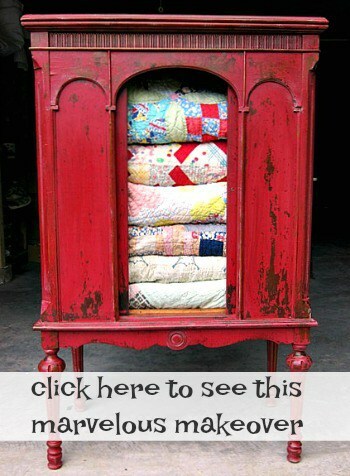 i love this for my daughter room, she just got a new apartment and this would look great!Thanks for the inspiration. Love this, and with a upcoming show and the need for some smallerish pieces, this so fits the bill. Great idea, I have one in my shop that will work great. Thanks for sharing. I love this. It looks so much better as a chalkboard then a mirror. And I love the turquoise color. It’s one of my favor colors. I’ve never tried the wet method. Will have to give it a try. Thanks for sharing. Looks great! I can’get over all the creative stuff you and Mr. JTS do! I love it. 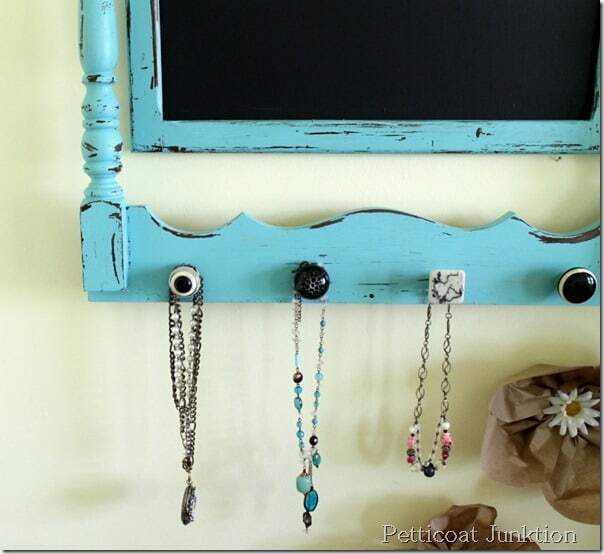 OMG, love, love, love your chalkboard/jewelry organizer. It is blue-tiful! I agree, you can’t go wrong with turquoise. Funny story about the black paint…I’m sure it wasn’t funny at the time! Anyway, I so enjoy your posts, projects and humor. And pinned this project.